WOW A container of 10 crickets purchased from the pet store. I put them in the middle of a large under-bed tray [about 2 ft by 3 ft by 8 in. high]. CHILD OBSERVATION: At first Maria observed the crickets using a magnifier. She counted them, and their legs and watched them eat a piece of carrot and try to jump out. Maria (age 5) tried to catch 1, but it kept jumping away. Then she thought about making a trap. I asked what did she think we could use. She got some white paper, markers, tape,and a scissors. She made some by folding the paper. One trap that looked something like a tube with a flap. Then she observed for several minutes to see if a cricket would go inside. When that didn’t work, she made several more traps. She observed for several minutes and decided the crickets liked the corners best so she put traps in the corners and was thrilled when several went inside. She counted the number she trapped and put the traps in order from best to worse. After we put the crickets back in their little habitat cage, and I thought we were done, but Maria decided she would build them a house. She used more tape and paper and spent at least a half hour to make a multilevel house. We put that inside the habitat and agreed to come back the next day to see if they liked it. The next day we discovered the paper covered with little dots. Maria used a magnifier and decided that was cricket poop and showed where they had crawled in the house. She also noticed that they had chewed on the paper. She counted how many crickets were inside the house. Materials: The crickets really fascinated Maria and inspired her to experiment to solve the problem of trapping a cricket. Allowing her to decide what materials to build with worked well and made her feel in-charge. 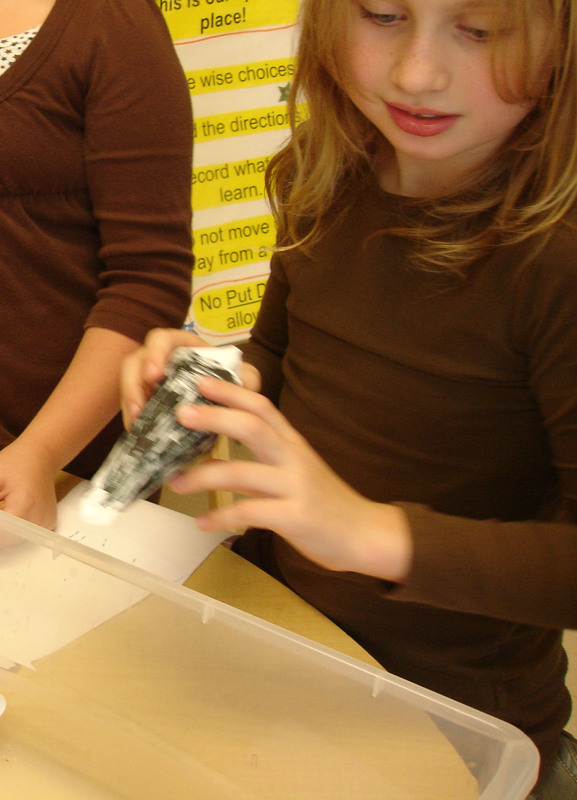 STEAM Learning: Maria used engineering and the arts to design and build her traps and house. She tested different traps like a scientist. She used math when she counted the crickets she trapped and when she grouped the traps based on the number inside. Previous postWonderful Objects of Wonder WOW!